Tools for Aiglets. How to make the tools to make aiglets. Aiglets, Translations of documents about. Translated from very old French. If you made or purchased aiglets, you need this: Attaching Aiglets. Some possible examples of extant aiglets meant to be sewn onto garments. A short review of some extant aiglets that I think show that some aiglets were sewn and not riveted. Only 18 pages, this is a moderately large file. I am honored to be presenting a longer version of my paper at the 5th Annual Symposium on Medieval and Renaissance Studies, hosted by the Center for Medieval and Renaissance Studies on the campus of Saint Louis University. Wednesday, June 21, 2017, 8:30am - 10:00am Plenary Session W12 - The British Isles in the Tudor-Stuart Period. I am the second of 3 speakers in this session. The video of my presentation "Insights into Understanding Aiglet Types and Manufacturing Techniques. With a focus on aiglets from the post medieval era." will be available in early July of 2017. Hosted by Western Michigan University's Medieval Institute, the 51st International Congress on Medieval Studies is an annual gathering of around 3,000 scholars interested in medieval studies. DISTAFF session 1, The 51st International Congress on Medieval Studies, May 12-15, 2016. Gerald A. Livings, Independent scholar. Session 456, Saturday 3:30 p.m. in the Schneider building room 1120. This is my first paper I have presented so please be forgiving of any grammatical errors. I suspect it will have a few flaws but as a non-writer I am happy with it. Please see the links at the top of the page. Please note the paper name has changed from "Techniques for Manufacturing Aiglets in Sixteenth-Century England: Comparisons and Conjecture" to "Aiglets: Medieval, Post Medieval, and Modern". The name of my presentation did not change. The original paper "Aiglets: Medieval, Post Medieval, and Modern" presented in 2016 is now out of date. Please use the link above to download the current version of this paper dated June 2017. Comparisons and Conjecture Youtube video of the presentation. A common lexicon for conversation. One thing that is needed is a common way to talk about a subject. Without words that have a common meaning, there can be little or no exchange of information. For example. The word "aglet". Does it mean a computer program? A type of airplane? Or the thing on the end of a shoelace? It means all three. So we must decide which type of "aglet" we are discussing and then find a common vocabulary so we may discuss them. That is why I chose to use the spelling that uses the letter "I" as it is less common and helps differentiates between the different types of aglets. In that mater, I am adding this small section to show the different definitions and words that may be used, and any information from other fields of interest that will have bearing on the discussion of aiglets. Metal sheath or tag at the end of a shoe-lace or ribbon tie, to facilitate threading. Much used in 16th and 17th century costume. Later any ornamental pendant; sometimes a small image. Also written aiguillet. From French word aiguille, meaning needle. A line from the play “Taming of the Shrew” by William Shakespeare. This one line has no clear meaning. Possibly a small ornamental figure forming the tag of a lace. Could this mean a woman whose clothing has been covered with many decorative aiglets? A gold or silver hat ornament to support a feather, or made in the form of a jeweled feather or sometimes a brooch supporting a jeweled feather. Aglet or ornamental tag; also, trimming or looped cords, as on military and navel uniforms. A broach or ear-ring decorated with a series of cascading gemstones of diminishing size, terminating in a thin, tapering, pointed stone. The style is also known as EN PAMPILLES. Just for clarity, this word has been included to prevent confusion. The word “aiguillette” is a jewelry term and can be confused with the word “aiguilette”. A person who makes aiglets. Flugelbinder is actually a fictitious word originated in the movie "Cocktail", during a discussion about the ordinary objects that can turn their inventors into millionaires. It has become an alternative form of aiglet. Alternative form of aiglet. Modern usage. 1. Tapering tip of something pointed; as, pin point. 2. Tie or lace, as of leather or ribbon, finished with metal tab or aglet at ends. Originally, used to fasten together parts of costume; later tied in bows for trimming. Authors notes: Some authors separate the word “aiguilette” out as a purely ornamental item. “Aglet”, “aiglet”, “aiguillet” and “aiguilette” all describe the same type of object. The differences seem to be the language used, (English versus French) and the century the word is being used. It is during the 16th leading into the 17th century aiguilette’s became less functional and more decorative. 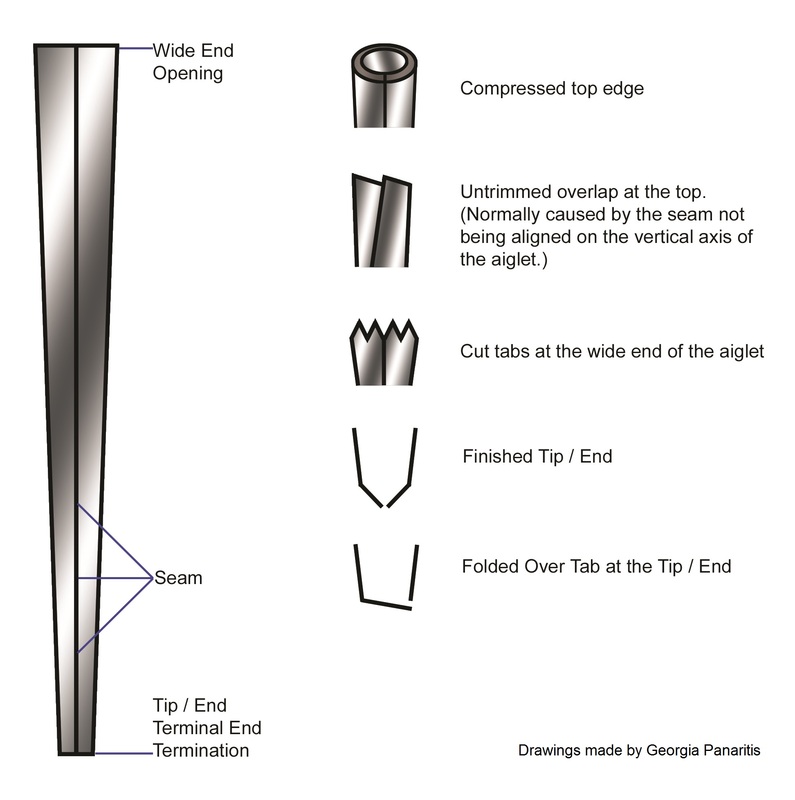 Discussion about metal seams as it relates to aiglets. How do you talk about a piece of metal when the edge is folded over? There is not a uniform lexicon where metal seams are discussed in archaeological terms, so the system of speaking about metal meas from the HVAC industry seems to be the most relevant. A "seam" is defined by a line along which two or more pieces of metal meet along a common plane. 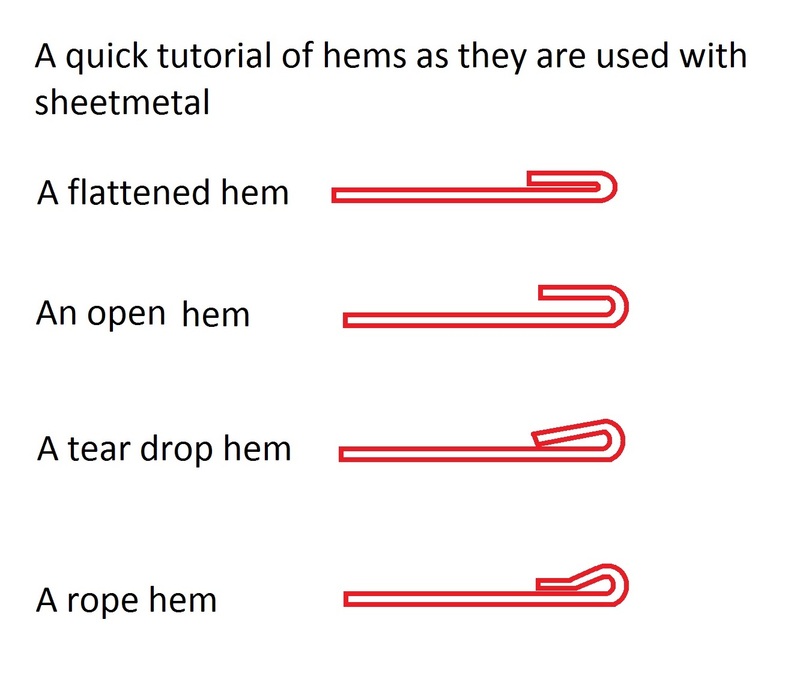 When a piece of metal is folded over, that is called a "hem". Hems come in several varieties and the chart below shows a visual description of each. How does this relate to aiglets? By letting us discuss and convey with accuracy a verbal description of what we see. We can most accurately describe the types of aiglets by also making sure we use precise terms in the description. While most often this precision of terminology is not needed, it is recorded here for when that precision is needed. Some scholars include the faceting at the top of aiglets as a way to secure them to the cord. I have decided not to include that on this chart as I believe that is either a decorative element or a result of poor workmanship. Under the current system of defining aiglet types, there is too much overlap in the descriptions of aiglet types. Therefore I propose the following definitions for types of aiglets. 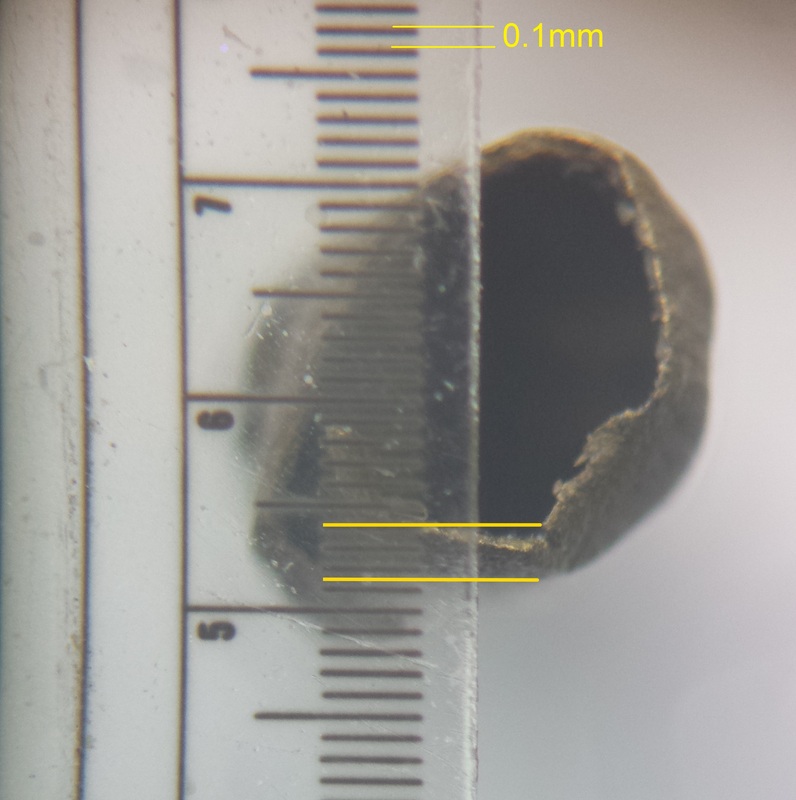 Type 1 aiglets have a seam defined by the edge of the metal butting against each other along the majority of the seam. The edges may overlap for a short distance at the base and/or the top of the aiglet. Type 2 aiglets have both sides of the seam folding inward to grip the cord or lace along the majority (75% or more) of the seam. Type 3 aiglets have an overlapping seam where one side of the aiglet overlaps the other side along the majority (75% or more) of the seam. One side of the seam may, or may not, be bent in to hold the cord or lace. Type 4 aiglets are cast, forged, or are made from solid metallic materials other than sheet. Type 6 aiglets are purely decorative and are not functional. They may be similar to any other style of aiglet in manufacturing. Faceting at the top of aiglets. Faceting the tops of aiglets to secure them To cords has been suggested by others as a viable technique. Several aiglets have had the tops filed to appear faceted. Is this a method to attach them or is it purely decorative? It has been suggested that the faceting at the tops of aiglets was to secure them to cords. At this point I do not believe that experiments would support this hypothesis. It is possibly a decorative detail or simply the top being poorly filed to remove any burrs that might interfere with inserting the cords into type 1 aiglets. Sevral aiglets in my collection show this at the top. Type 1 and type 2. This aiglet is Chelmsford #30.70. A type 1 aiglet. This aiglet is in very fine condition. 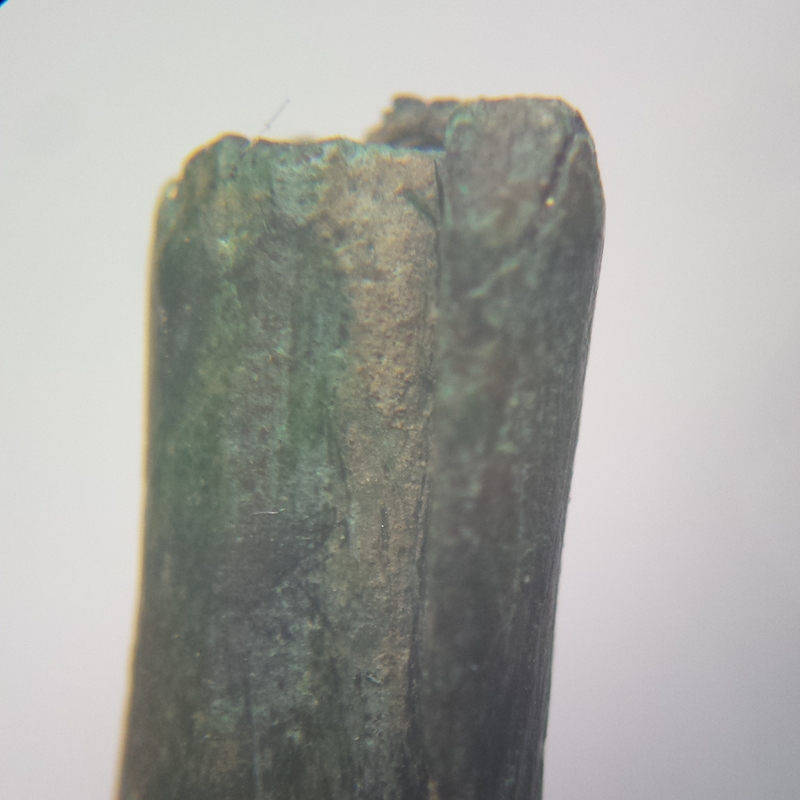 It is a very normal type 1 aiglet with filing at the top which gives it a faceted appearance. The part of the metal on the bottom lip of the faceted area is bent inwards twords the cord of the aiglet about 0.2mm. With the metal being filed to a thinness at the top of about 0.1mm, it will not secure the aiglet to the cord with only this method. The aiglet depicted in Figure 30.65 from Cunningham, C. M., & Drury, P. J. (1985), figure 30.65 had cracked down its length and had several smaller pieces break off, and some were missing, during the journey from Chelmford, UK to Wisconsin, USA. When examined, the aiglet was determined to be a Type 2 aiglet where both sides of the metal is folded into the lace to securely hold it in place. Only one side of the seam made the trip. This inner part, having been protected from polishing, wear, and corrosion, clearly shows marks left by tools during the manufacturing process. The edge has a pattern of bends suggesting it was folded over the lace, then crimped several times along its length by a small set of needle nose pliers to tightly grip the lace before the aiglet was bent into a round shape. It is possible it may have been done with a punch but that would take longer and involve more tools. The top of the aiglet is on the right and the seam is at the bottom of the image. I believe the image below shows enough evidence to say pliers were used during the manufacturing of type 2 aiglets. It is possible pliers were also used in the manufacturing of type 3 aiglets. If you are a historical reenactor, making aiglets can be hard to do if you have never done it. This video will show you how to take a flat piece of brass and form a completed aiglet. This video works on the assumption that you have already made a mandrel, pattern and have cut out some blanks. A short video explaning how to finish off the ends of aiglets. This shows how to file and sand them after they are made.